The ReadyBath Luxe Bathing Systems conveniently clean, moisturize and condition skin without soap and water. ReadyBath provides a comforting, consistent and clinically effective bedside bath. It helps keep skin feeling healthy because its no-rinse formulation cleans and moisturizes without stripping the skin. Scent and pack-count options let you choose the right match for your staff, budgets and the needs of those you care for. Even as the entry point in the ReadyBath line, you’ll quickly recognize that this is no ordinary bath cloth. It’s strong, soft and ready to clean from head to toe. And the gentle cleaning solution leaves skin feeling soft and smooth, too. The ReadyBath Luxe Bathing Systems is a convenient system that can be used at room temperature or warmed for patient comfort. Soft, disposable washcloths are pre-moistened with a gentle, no-rinse, pH balanced hydrating cleanser that eliminates the need for basins, soaps, linens and lotions. Bathing time is cut in half so nursing staff is free to provide other patient care. Patients' skin is soothed, moisturized and conditioned by Allantoin. 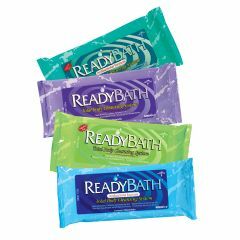 ReadyBath Premium Bathing Systems have an antibacterial formula that helps kill germs and eliminate odors. Available in fresh gender-neutral scent or fragrance-free. Each tamper-evident, resealable pouch contains eight premoistened single-use washcloths so that each body zone can be cleaned with a separate cloth. Single use pouch reduces chance of cross contamination. Z-folded cloths are easy to pull from the pouch. Both product and packaging are latex-free. by out dood jim from St. Petersburg Fl. My son is in Afghanistan at an outpost where all water has to be brought in. I knew about the product from hospital use and knew it would help him to stay clean without extra water. My husband also commented that the product would be handy for camping trips....wish it had been available years ago!! Easy Storage. Sturdy. Effective. Easy To Use. Good Smell. Good Value. Convenient. Lightweight. No Residue. Medical Professional. Athletic. Outdoors Enthusiast. I have used these in both my practice for producing a clean field for taping and acupuncture as well as in the field while hunting, fishing, camping and working outside where cleanup water was either unavailable or too precious to use for washing.The cloths are very heavy duty and I have reused them to wipe down equipment, cars, tables, etc. Great value and better than the store-bought Wally-World wipes. Easy Storage. Easy To Use. Good Smell. Good Value. Lightweight. Sturdy. Convenient. Effective. Safe. Elderly. Daily Use. After a stroke. I use them every day. Easy to use. by Rick from Mulberry, Fl. Easy Storage. Sturdy. Effective. Easy To Use. Convenient. Lightweight. Safe. fragrance free option. hypoallergenic option. Caregiver. Quality Oriented. Value Oriented. Average Health. Independent. temporarily disabled. Temporarily unable to take a shower or tub bath,so Ready Bath hypoallergenic and fragrance free type makes it possible for me to really clean my very dry and sensitive skin and feel fresh and clean every day. what size are the cloths? 8"x 12" Like the bathing systems used in many health care facilities. There are 8 Ready bath cloths in each pack. There are 8 cloths in each individual package.